So I rented Most Wanted from GameFly for some reason. I tend to absolutely hate arcade racing games. I want the most realistic experience possible, therefore I prefer Forza 4 (which is absolutely amazing). Anyway Need for Speed is what you’d expect from a modern arcade racer…Flashy lights, nitrous, dubstep, cinematic wrecks and more dubstep. One thing that really bugs me is that during a race your car will literally change colors multiple times just because you drive through a repair booth. What the hell is that? Anyway, I recorded a gameplay video, though it doesn’t look great. I recorded it using my MacBook camera using the Windows 8 camera app…I’m not sure if it’s something to do with the software, or just being a laptop webcam (though I thought the MacBook camera should be pretty decent…maybe it’s just because I’m in Windows right now). So I’ve spent a day (not an entire day of course) playing Forza Horizon and I’m here to report it is indeed a remarkable game, worthy of the Forza name. For those who may not know, Forza Horizons is not exactly a ‘Forza’ game. By this I mean it’s not part of the main Forza series (Forza Motorsport 1-4), but rather a spinoff of sorts developed by Playground Games rather than Turn 10. Playground Games is a collection of developers who worked on a variety of racing games to include Project Gotham, Dirt, Grid and Burnout. 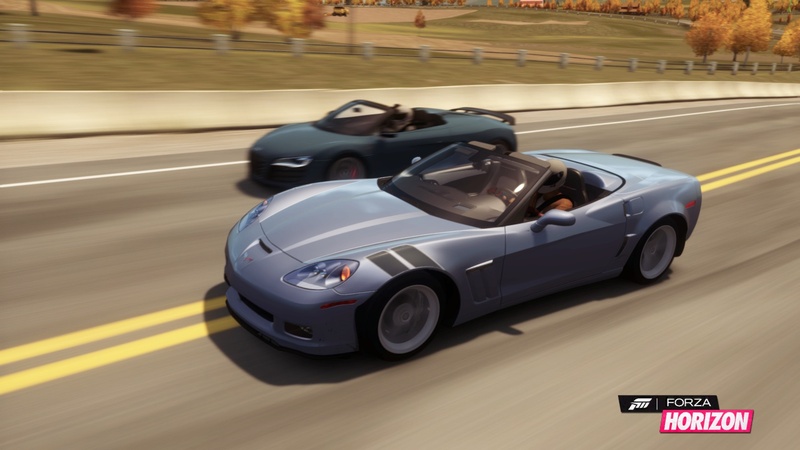 Forza Horizon, therefore, has a different feel than Forza 4. It’s more approachable, more casual, and I suppose you can say a bit more ‘arcadey’. As a Forza fan I thought this different feel would “ruin” the Forza name, however that is not the case at all. It’s the best of both worlds. It’s more realistic than other arcade games and it’s more about the cars than other games. It does differ from Forza 4 in many significant ways though. The cars and tracks feel a little different. They’re a little more forgiving I’d say. You can bounce off of walls or other cars, or skip across the dirt and not have to rewind the race. 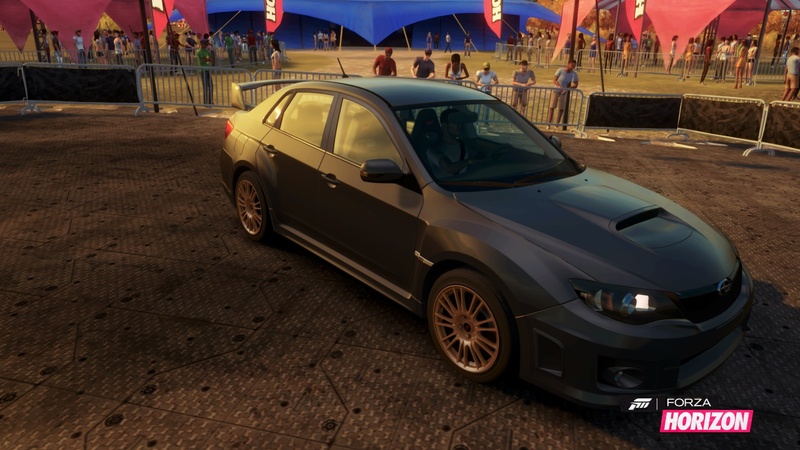 Forza Horizon is all about Horizon, a music and racing festival held in fictional Colorado. The game has a story, though it’s nothing special. You’re a no name racer who is climbing the ranks to try to dethrone some ‘bad boy’ unbeatable race champion. What is interesting about Horizon is that it’s not incredibly menu driven. When you compete in a race you’re thrown right back into the world to roam wherever you choose. You can see all of the races and events on your map and drive to whichever race you want, all while discovering collectibles (such as signs that give you a 1% upgrade discount for every one you find, or classic cars stored in hidden garages), challenging other drivers to road races, or simply exploring the world and getting a feel for your car. What’s also neat is how Rivals mode is integrated into the game, rather than being presented as a separate mode. When you complete a race you’ll be presented with the option of competing against another player’s ghost based on your lap time. The challenge will always be someone who finished slightly faster than you, so there’s always an incentive to try to do better. There’s not much loading involved either, especially if you have the game installed on your hard drive. If you win the rival challenge you’ll earn a reward in credits, usually 1,000 credits or so with a bonus based on difficulty, skills completed (more on this later) and mileage. In addition to all of the collectibles and side events available to you as you explore Colorado, there’s also a constant mini game of sorts in the skills challenges. You earn points for doing burnouts, drifts, e-brake drifts, destroying the world (knocking down signs and such), driving fast and much more through ALL of the game modes. Whether you’re in single player or multiplayer you’re always earning points and when you ‘level up’ each challenge you’ll get a nice credit reward. The variety of races is nice. You’ll have dirt track races, asphalt races and mixed track races. There’s also a day and night cycle in the game, so there’s even more variety. Furthermore you’ll find both circuit races and start to finish races. 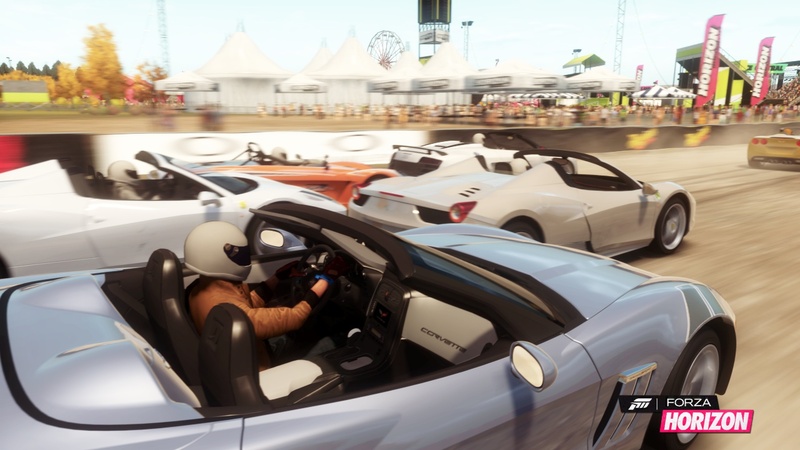 There are also events where you’ll race against an airplane or street races for large credit rewards, or pink slips. Multiplayer in Forza Horizon is an absolute blast. It’s very smooth and a whole lot of fun. It’s also incredibly addicting. For every level up in multiplayer you’ll get a random slot machine reward which could earn you anywhere from a few thousand to a few million credits, or a variety of cars. Everything you earn is available for use in both multiplayer and single player which is a nice incentive to keep racing and hope you nab that exotic car. For even more fun, there’s playground modes in multiplayer which includes my personal favorite: Infected! If you’ve ever played Infected in Halo or Call of Duty, you know the premise. One player starts as the ‘infected’ car and he has to infect other players by ramming into their car. This takes place in a different sectioned off area each time with plenty of intersecting roads which makes for some destruction derby like chaos. So far I’ve had an absolute blast in Forza Horizon. If there’s any complaint at all it’s that there’s a much smaller selection of cars when compared to Forza 4. Of course there’s DLC and a season pass which is nice, but I wish there was more there from the start. The Season Pass is $50 and includes the first 6 monthly car packs (6 cars in each) and the Rally expansion due out Dec. 18 which will include a variety of rally cars and all new missions and achievements. So I’ve been a huge fan of the Forza series since I first played Forza 2, but I have to admit I hadn’t been following Forza Horizon much. First of all it’s made by an entirely different development team and it’s targeted toward an entirely different audience than Forza 4. That said, after watching reviews and trailers over the last few days (and Giant Bomb’s 40 minute ‘quick look’) I’m finding myself interested in the game. Sure it might not be all about realism and the ‘story’ looks incredibly corny, but the game is incredibly pleasing aesthetically. The fictional interpretation of wide open Colorado road looks amazing! The cars look as good as ever also. I love the authentic interiors in Forza, and am glad they return in Horizon. Nothing is more thrilling than driving from inside the car. 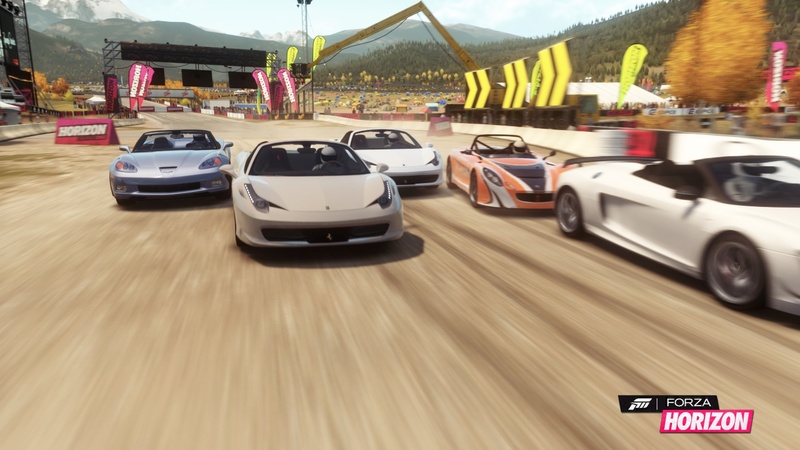 I’ve never liked the arcade racing games like Burnout or Midnight Club, yet Forza Horizon looks to be the perfect mix of Forza realism and a more casual racing environment.